Bevan offers a range of dropside bodies for the transport sector and builders' merchant industry, from 3.5 to 32 tonnes gvw. Choose from lightweight dropside bodies to maximise payloads through to purpose-build, heavy-duty bodies for vehicles up 32 tonnes gvw. We can tailor the design to be as light or robust as possible for certain industry sectors. For example, our specialist exclusive flooring designs maximise grip and weight. Our market leading safety designs ensure that your employees can work at height in a safe environment, whilst still utilising the vehicle to its full extent. 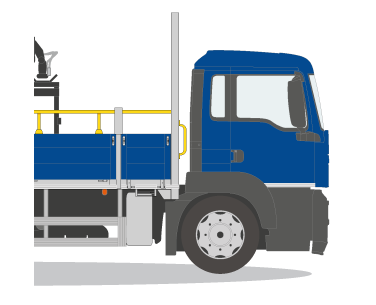 Our patented Safe-T-Drop system can be fitted to all types of dropside bodies and will protect your driver, meeting all health and safety requirements. It can also be retrofitted to your existing fleet. The system is designed so that it has to be used and cannot be removed from the vehicle. It also has to be in place with the sides up, which cannot be raised without the system being engaged. The design is simple, free of moving parts and easy to maintain. We tailor floor type, dropside configuration, crane specification and mounting position to meet your requirements. We pride ourselves on leading the market in innovation. Features including new floor types such as plastic grip floors for plant hire, punched alloy flooring and impregnated yellow safety boards as standard, all go towards our aim to make the vehicles as easy to use as possible without adding unnecessary cost. We also fit cranes at our own premises, giving you peace of mind that your vehicle is in safe hands with our experienced team. This automatically reduces the need for vehicle movements and lead times in builds, offering a more efficient and tailored service. As well as our dropside bodies, we manufacture plant & machinery bodies, vehicles for highways operation and a wide range of tippers. The Safe-T-Drop system is easy to operate and allows our drivers to access their vehicle beds safely, in line with our strategy of eliminating falls from height. The rails pose no hindrance when loading or unloading, and are strong enough to withstand contact with the fork lift truck.